Jammu, September 11: Lieutenant Neeru Sambyal is a proud woman today, her resilience having helped her fight all odds and overcome the toughest phase of her life. Hailing from Samba in Jammu and Kashmir, the Army officer has set an example for those trying to pick up the threads of life. Her message: “Never give up”. “On May 2, 2015, when I lost my husband, I lost everything and slipped into depression. But my two-year-old daughter gave me motivation to come out of hopelessness. I succeeded after several attempts,” says Lt Sambyal. A ‘C’ certificate holder of the National Cadet Corps, Lt Sambyal was commissioned as a Lieutenant in the Army Ordnance Corps on September 9. She joined the Army in 2017 and graduated as an officer after undergoing a one-year training at the Officers Training Academy, Chennai. 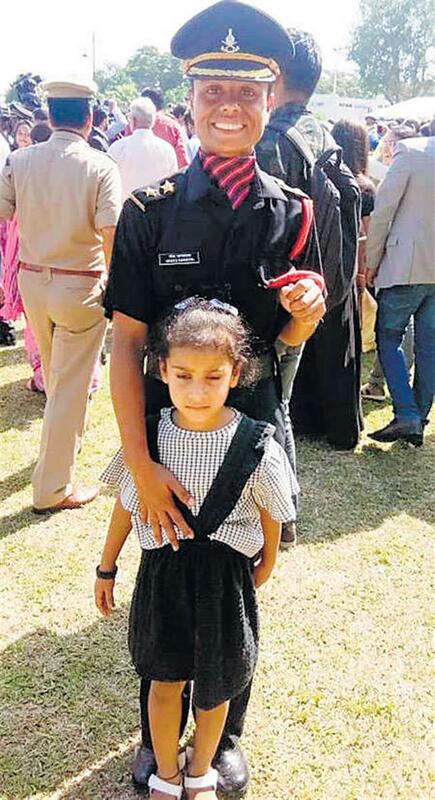 Lt Sambyal lost her husband Rifleman Ravinder Sambyal after three years of their marriage. He passed away while attending a drill in his regiment. “I belong to a Rajput family where lot of social stigma is attached to widows. As such, joining the Army would never have been easy... I reluctantly shared the idea with my father-in-law who not only supported it but went out of the way to help me realise my dream,” says Lt Sambyal, her voice choking with emotions. Lt Sambyal’s brother Varinder Singh Slathia, who is serving in the Air Force, also encouraged her to translate her “bold” decision into reality. Her parents belong to Gurha-Slathia village in Samba district, which is known for producing valiant soldiers. She was married in Baada village in the same district. “I understand the trauma and agony faced by widows in our conservative society. I was able to take this decision only with the support of my in-laws and brother,” the officer says. Having cracked the SSB exam in the first attempt, Lt Sambyal says her father-in-law and brother’s encouragement were enough for her to fight the odds. “I was least bothered what people would think after my family openly backed me,” she says, adding she now would serve the nation with the same zeal as her late husband did.